Our kitchen would become a mess of tanks and milkweed plants, as we raised up to 20 caterpillars at different life stages at a time. At times there would be escapees, and my sister and I would have to scour the kitchen searching for a caterpillar, that itself was looking for the perfect place to form its chrysalis. Though this project was often messy (milkweed sap is sticky) and smelly, it fueled my and my sister’s fascination with nature and insects. Because of this experience, I have always been a great admirer of the abundance of monarchs that come and go each summer. I am now realizing though, that I may have been taking them for granted. Their yearly presence in my yard and the places I visit depends on a lot of types of habitat and weather conditions during different times of their life cycle, and many of these are under stress. Monarch butterflies begin their lives as a caterpillar. The caterpillars of this species of butterfly feed exclusively on species of milkweed plants (Asclepias spp.). Some of these species are very common, such as common milkweed (Asclepias syriaca) and whorled milkweed (Asclepias verticillata), while others are much rarer. The caterpillar needs to feed on the plants for about 10 to 14 days before it’s ready to pupate into a chrysalis. The caterpillar will remain in the chrysalis for another 10 to 14 days undergoing its transformation into a butterfly before it emerges and flies away to continue the cycle. The monarch butterflies we see around us are a part of a continuum of breeding butterflies that spread north from their winter hibernation grounds in Mexico. The hibernating butterflies become reproductive in February and March, and they travel north laying eggs on their host milkweed plants as they go. Most monarchs typically live 2 to 6 weeks, and each successive generation travels further north, all the way into Canada. The last generation of butterflies to emerge in the summer is the southern migrating generation, also known as the super-generation. They emerge as a butterfly, and go into reproductive diapause, which means they won’t immediately be reproductive. This is because they are the generation that migrates to Mexico to hibernate through the winter. An astounding aspect of a monarch butterfly’s life is their mass migration from the northern and central regions of the continent to forests in the Sierra Madre mountains in Mexico. Their migration starts in October, and can be up to 3,000 miles one way. Only butterflies east of the Rocky Mountains migrate to Mexico, while butterflies west of the Rockies migrate to Southern California. In Mexico, the butterflies cluster on to Oyamel fir trees by the tens of thousands to stay warm through their winter hibernation, which can last 6 to 8 months. Having multiple habitat types on which they depend for the survival of the species means all of these habitats need to be available in order for them to thrive. There are currently several factors causing stress on the monarchs during different parts of their species life cycle. Milkweed can be very common and abundant, but habitat loss is affecting its overall abundance just like any other native plant. Additionally, milkweed commonly grows along roadsides, and can be used as host plants for monarchs in this setting. But it is common practice to mow roadsides for visibility and aesthetics. Loss of habitat is also occurring in the Mexican forests in which the monarchs hibernate. Though the butterfly’s hibernation grounds have been protected as a part of the Monarch Butterfly Biosphere Reserve since 1986, illegal logging of the Oyamel fir trees still occurs. Extreme and unusual weather conditions can affect the habitat and delicate microclimate that the monarchs survive in while hibernating. Excessive winds and storms over the 2015 and 2016 winter caused trees to fall, which was a major cause of degradation of 174 acres of forest in the reserve. Though there are many threats working against the monarch, there is still time and a lot we can do to help them. You don’t have to turn your kitchen into a monarch nursery like my sister and I did in order to make a difference. 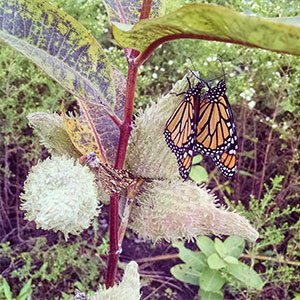 Simply planting common milkweed plants in your yard or community provides the host plant for the caterpillars, and a valuable nectar source for the butterflies. Additionally, planting flowers that bloom throughout the growing season provides nectar for the butterflies throughout their breeding and migration cycles. If you want to do even more to be involved with monarchs, there is a plethora of programs to be involved in; from tracking the butterflies as they move north (earner.org/jnorth/sightings), to having your garden certified as a monarch waystation (monarchwatch.org/waystations). If you would like to learn more about monarch butterflies, a documentary called Flight of the Butterflies is currently available on Netflix, and you can also visit the U.S. Forest Service website here , or visit monarchlab.org for more information about the species and programs. If you have not had the pleasure of seeing monarch butterflies close to home, it’s a great time of year to see both caterpillars and butterflies at Kankakee Sands.